NEW YORK — Walgreens Boots Alliance Inc. (WBA) sees significant opportunities ahead as the company integrates its global operations. 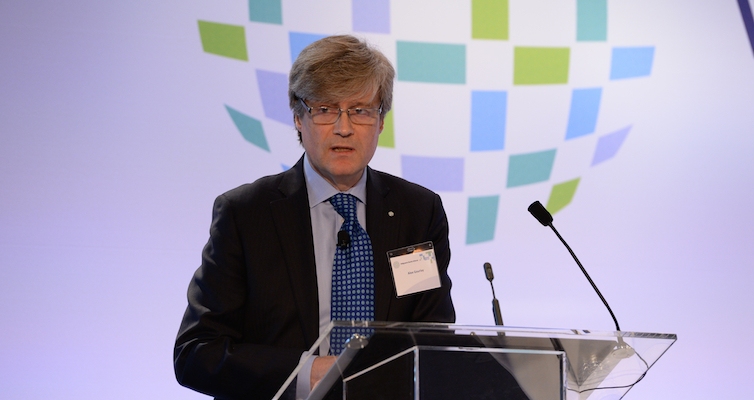 Stefano Pessina speaks at Walgreens Boots Alliance’s Analyst Day event in New York. “Our size and scope means that if we are effective in our delivery, we will be one of the companies that helps shape the future of health care, pharmacy and retail on a global basis,” executive vice chairman and acting chief executive officer Stefano Pessina said. Speaking earlier this month at the first-ever Walgreens Boots Alliance Analyst Day event, Pessina detailed the progress that has been made in integrating the company’s operations in the months since Walgreen Co. and Alliance Boots GmbH completed their merger on December 31, 2014. The analyst meeting, which Pessina said was held in the spirit of transparency, featured presentations by the leaders of the company’s three divisions — Retail Pharmacy USA, Retail Pharmacy International and Pharmaceutical Wholesale. Alex Gourlay, WBA’s executive vice president and president of Walgreens, detailed the strategy for retail operations in the United States. Walgreens president Alex Gourlay detailed the strategy for U.S. retail operations. To bolster its pharmacy business, Walgreens intends to offer the best customer experience, including a robust online and mobile component, while strengthening its partnerships with payers, Gourlay said. The chain will also focus on services that support core dispensing and generate incremental revenue, while optimizing the clinic model. In the front of the store, Walgreens has focused on efficient retailing to expand margins. It is simplifying the supply chain to improve the on-shelf availability of products while driving inventory productivity. Other efforts include leveraging its Balance Rewards program, which will be enhanced soon with additional ways for consumers to earn points and rewards. Walgreens is also determined to control costs, Gourlay said. The company committed last August to achieving $1 billion in cost reductions by 2017, and to that end Walgreens has implemented a corporate hiring freeze and is changing its policies on travel and expenses, and the use of management consulting and temporary labor. There has also been a pay freeze for top U.S. executives, and the company has increased its cost savings goal from the initial $1 billion to $1.5 billion. These and other moves are intended to create a sustainable cost model for Walgreens, Gourlay said, allowing the chain to save money that can be reinvested in key areas — including information technology, store formats, customer service support and personnel training and development — that will help drive further growth. The Retail Pharmacy International division is pursuing organic growth in its established markets in Europe, Asia, Latin America and the Persian Gulf. It is also looking for options in new markets. Pessina described Pharmaceutical Wholesale as an “enabling business” that also generates a great deal of cash for the company. “Wholesale lets us enter new markets at scale more rapidly than retail, while its cash flows help give us financial scale and efficiencies,” he said. Pessina acknowledged that the search for a new chief executive officer is taking longer than expected, but he assured analysts that in the meantime he would not be just a caretaker CEO.